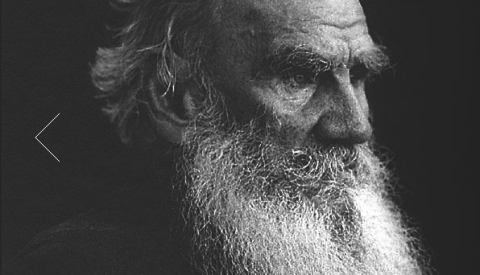 This is surely worth a quick heads up: Leo Tolstoy’s entire body of work – all 46,000 pages of it – will appear on the Tolstoy.ru web site. According to Tolstoy's great-great-granddaughter Fyokla Tolstaya, all of the author's novels, short stories, fairy tales, essays and personal letters will be made freely available in PDF, FB2 and EPUB formats (which you can easily load onto a Kindle, iPad or almost any other ebook reader). She goes on to tell the Russian newspaper RIA Novosti that the "90-volume edition was scanned and proofread three times by more than 3,000 volunteers from 49 countries." Truly an incredible crowdsourcing feat. What's the rub? You have to read Russian. Yes, it's potentially a downer. But you can always find Tolstoy's major works in translation in our Free eBooks and Free Audio Books collections. And if that doesn't make you feel better, see the excellent bonus material below.